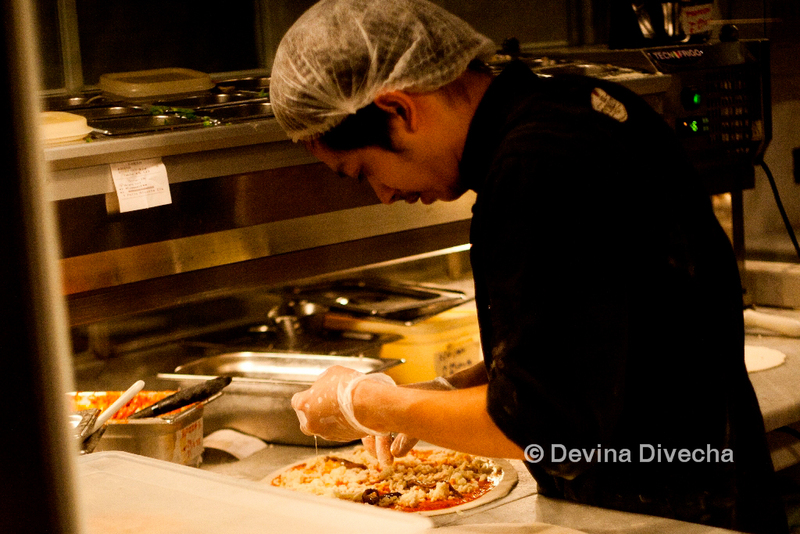 After living in the UK and having excellent Italian food there, and going to the US and gorging on Giordano’s deep dish pizza, I’ve developed a hankering to find good pizza and Italian food in the UAE. One night I had plans for an evening out, which got cancelled (curse you, O ditcher! ), and I was feeling too…meh…to go home instead. I wanted an evening out damn it, and an evening out I would have. I called up my most recent food-partner-in-crime, Wajiha, and moaned in frustration. Always up for a fun time, she said she’d go out with me for dinner that day (in spite of having another dinner planned late that night; yes, really). I looked around for places which I hadn’t tried before, and remembered another partner-in-crime, (my coffee/chai/desserts/photographer crime buddy) Shruti, had mentioned Red Tomato Pizza. Wajiha had been there before, but was ready to go again. Soak in the sight because that was the scene for all of 15 minutes before the food arrived. The venue, hidden among the streets of Al Barsha, very close to the Mall of the Emirates, attracted me from outside. A rustic exterior with charming wooden chairs and plants evoking an Italian countryside touch, Red Tomato Pizza was calling out to me. “ENTER DEVINA, ENTER!” And enter I did. The first thing you’d notice is how homey the place is. I can see why Wajiha thought she could work there. Well, you could get some work done there, but probably not with me, lots of food and a massive camera flash going off in your face. 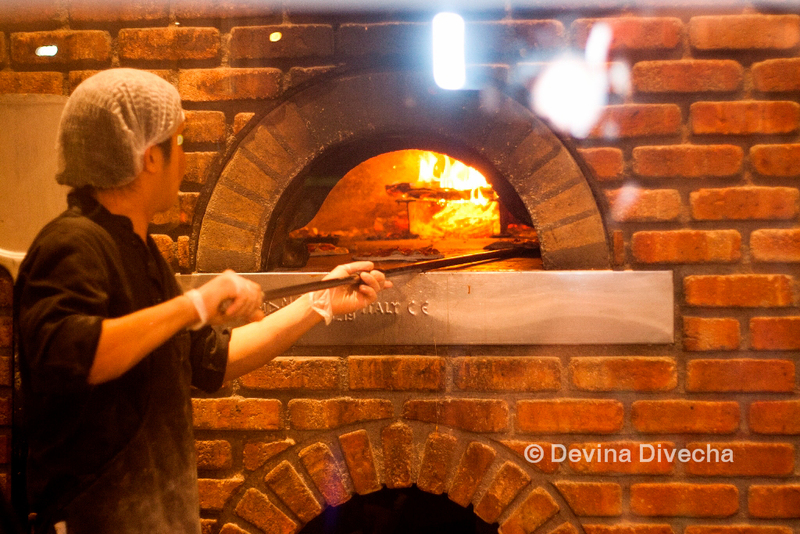 The next thing you notice is the wood-fired oven nestled towards the end of the space, safe behind a glass barrier. But you know it’s there even before you enter, if you look closely at the sign outside where it’s mentioned. After settling in, we ordered arancini (deep fried rice balls filled with cheese and meat sauce) and for the pizza, I picked the Pollo e Ricotta. While waiting, we ate a lot of bread (and I drank home-made lemonade)! The food doesn’t burn a hole in your wallet, but is more or less reasonable for what they offer you: good food in a comfortable setting (and a VERY romantic ambience I might add; how you doin’ Wajiha?). The arancini was pretty good (so much cheese), which is why I rather felt like a cheese snob when I wished it wasn’t mozzarella I was chomping into. Hot and cheesy goodness was had. So the pizza (chicken and ricotta) I got was very good – light, soft and very, very, very fresh. I was happy. Wajiha said the beef one she had the last time was better, so I think I will return and try out the beef variety too. And what, pray tell, is the point of going to an Italian restaurant without having dessert there? I bet there’s a law against it. I bet they (whoever, ‘they’ is) come and issue warnings for this sort of thing. So we ended our relaxed night out with tiramisu. Which was good. I approve. I stamp my FooDee seal of approval on it. It’s not the best tiramisu I’ve ever had in my life (actually, only a few days back there was a very good tiramisu I gobbled in Bombay, but that’s another story), but it’s one of the good ones I’ve had in Dubai. I am happy. I shall eat you again, tiramisu. I shall! Wikipedia tells me that the translation of tiramisù is “pick-me-up” or “make me happy,”. I was happy. Which means it worked. It also tells me “tiramisu” is thought to be a name in Italian – so now I have two baby names in mind for potential children: alfajorés and tiramisu. I sense a trend. Somebody stop me. Word of advice: don’t get them to deliver to you when you can go there and eat. Please, don’t. You’ll love the interiors and the way it enriches your enjoyment of the meal. It may not have been the evening I planned but it was a darn good one – company-wise and food-wise! Parking tip: If you see a parking spot in the lane leading up to the restaurant, take it there without a second thought. Once you get to the traffic light in front of the restaurant, you can either go straight and get stuck amidst traffic-of-people-dodging-SALIK or go right and get lost in Al Barsha. This post has made me hungry. The soup I had for lunch just pales into insignificance now….Lovely photos – btw. The place is indeed so welcoming! And the Tiramisu looks divine. Angela – reading this post just now has made me hungry again too! Haha. Soup is still good. Thanks for stopping by :)Abigail – It’s VERY welcoming. You honestly feel like you’re relaxing in someone’s backyard or something. Plus the enticing smells inside totally helps! Wajiha – Hahahaha yes you’re an awesome hand model. Love the pic where you’re holding the pizza slice. This has so been on my to dine list for ages. Glad you said I should eat there as I was planning on ordering in. Hope they do a good Napolitana pizza or else Margherita. Have you tried 800 Pizza? You have got me to crave for pizza now..I love the potential baby names!!! Find me a few more to share??? hehehe Ur post as usual- fab..ur pics..AMAZING! Dina – Hahahaha, I think it’s easy to get you craving in the current situation anyway 😉 More baby names that could also be names of food? Right, on it! And thanks for the comment as always. Brightens up my day! OMG Drina, I keep forgetting you live there! Right, for my Red Tomato Pizza repeat performance, will you be my date? 🙂 We shall Gorgonzola-walnut-and-Pear ourselves to gluttony.Thanks for the compliments…I enjoyed taking photos here…just looks so good! Gorgonzola-walnut-pear pizza????? Sounds delish. I’d love to join the Red Tomato Pizza repeat. Though it won’t be a balcony jump for me, maybe a nice leisurely walk to burn the calories 🙂 Lemme know when. I;m in! So I finally got this to work!Well I barely remember what I wanted to say!This place looks interesting! I have been craving pizza, pasta, seafood and thai food lately! No i’m not pregnant! The pizza looks crispy and I can almost the smell the burnt parts of the crust! Love that!And those risotto balls!! Oh boy! I need to make those! LaMereCulinaire – Hahaha I’m so glad the comment finally came up. Let me know if you ever visit the place and whether you like it. Thanks for stopping by, and I 100% appreciate your efforts to post a comment! I sense many people wanting to eat here! Repeat it is, and very soon hopefully.Didi – don’t have to walk…I’ll pick you up ;)Wajiha – ooooh more people recommending this place…will try it out. I’ve been looking for a good Italian restaurant myself. You’d think with a global cuisine like this one, it wouldn’t be so hard to come across. This place looks good, I have to go soon! Lady, almost immediately after you published this post, I had a massive carb craving. I had this place in mind for sure since you’d written about it. Then I hopped over to Timeout to see their ratings (they had an entire article dedicated to pizza…of course) and Red Tomato was a 5/5. Plus it was reasonably priced. So with multiple confirmations, your review, Timeout, and Drina’s, I went over and tried it. AMAZING. What a find. Love the ambiance, reminded me of this pizza place in Brooklyn called Grimaldi’s. We had the pizza bresaola and the arancini, both of which were very good. I’d say I like my crust a bit more crispy, crusty down the center (at least up to 60% of the way down from the perimeter) but that’s a momentary subjective consideration, and definitely not something I dwelled on five bites into dinner.So lovely, lovely place. AND GREAT SERVICE. Such thoughtful service it made me sigh. I can’t wait to take my folks back. Thanks for sharing this place, it’s gonna become a staple for me. I Live in a Frying Pan – Yay glad you visited and liked it! It was such an impulse to go for pizza that day, and I’m very happy that I did. Ooooh I actually didn’t know Time Out gave it a 5/5…interesting. Ohhh yeah, ambiance totally does it for me…that’s why I’m hoping people will actually go there than do takeaway.Speaking of service, they were really sweet about me photographing everything. As long as I didn’t go behind the glass barrier, they didn’t care. My server was veryyy amused. Hehe. Oooh!! This is my family’s fav place . 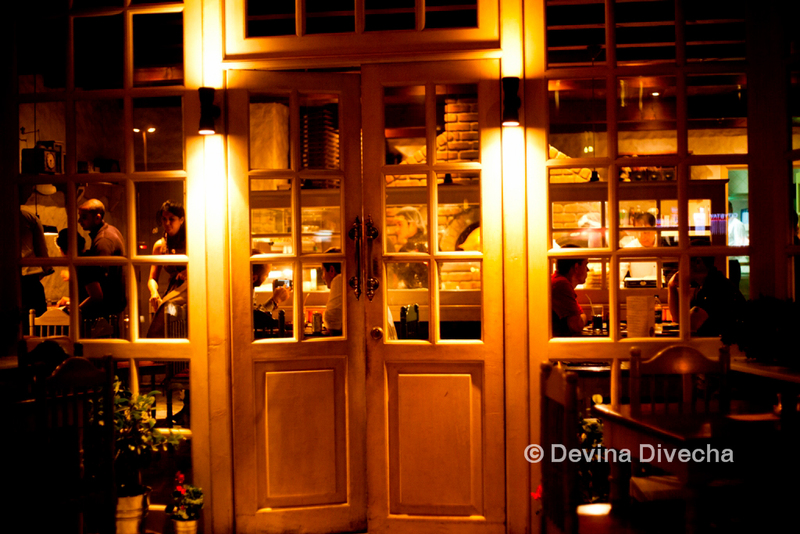 The food and the ambience is just wonderful and the tiramisu Mmmmmm……. . I can’t wait for the weekend to come , to go there . my month is slurping, going down to get some tiramisu seeing your pic , looks ummmmm the place also looks cozy, next time must go there. Love the review. The Italian place seems wonderful. You are right about the scrummy Italian food in the UK. The tiramisu looks wonderful and seems like quite a name that can catch on if you are seriously thinking of naming your babies so. 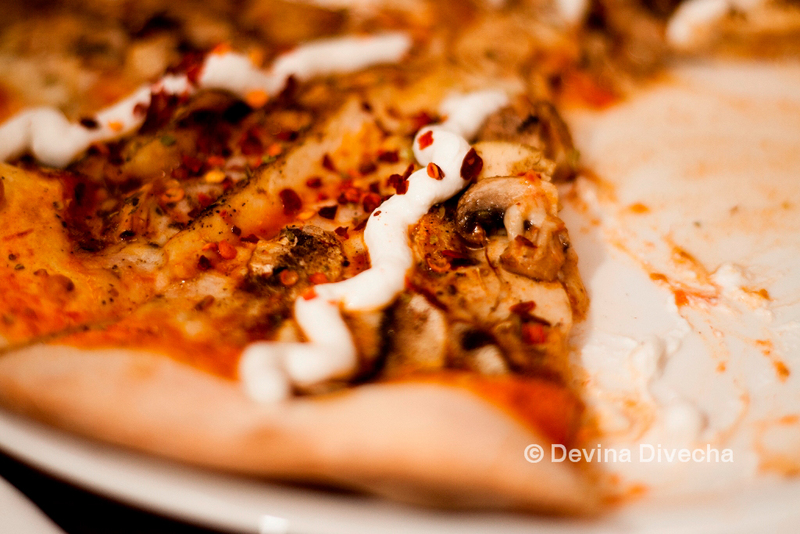 Shabs – I’m finding so many pizza enthusiasts here, it’s awesome! Yup, I can’t wait to go back too. Just need to clear up my insane schedule then dig in :)Fui! OMG your first comment on my blog! Haha, I loved the tiramisu at COO in Bombay…is that where you’re getting it from? Come back to Dubai soon with the kids…we’ll go to all my new finds and not just the old haunts. Anita – Thanks very much 🙂 Yup, I can’t wait to revisit my fav places in the UK whenever I return. Hahaha yeah, baby-naming opportunities are either very far away or non-existent, so for now, it remains a food-induced hazy dream ;)Thanks for dropping by, as always! Next A frankie-turned-kathi-roll challenge…how could I refuse?